To anyone else, she was just an ordinary girl who went about her business quietly. But to God, Mary was someone very special. She had found favor in His eyes. 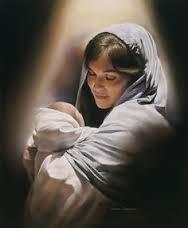 Mary was chosen to be the mother of Jesus, the Savior born into this world through a miraculous virgin birth. From the things I know of Mary (as she is portrayed in the Gospels, particularly the book of Luke), I picture her to be a young girl, quiet and gentle. I picture her to be pleasing to her family and friends. I think of her as one who silently watches and contemplates as she works diligently, even while those around her are scurrying busily to complete their tasks. Can you imagine how this rule-following, people-pleasing young girl felt when she learned that she had found favor with the Almighty God? And then, can you imagine how she felt when she realized the full implications of living her life as a young, unmarried girl who was suddenly mysteriously pregnant? I would have done some mourning when I had to leave my home and family, especially at a time when I was “great with child”. What did she do? What did she do when the first pains came and she had no place to lay down? No shelter over her head? No mother’s hand to hold on to? What did she say when she realized that the old barn was really it? That she was going to have to lay down on the grimy, dirty ground and have the Baby that was going to save the world? What did she think when He was born? When she was able to hold her Creator in her arms? What went through her mind when she looked into the eyes of the One who could see into her soul? How about when the special occasion was crashed by a bunch of shepherds and wise men who wanted to see and worship the Baby? How did she react to their entrance? I’ve always wondered…did she know? Did she know what He would go through some 33 years later? The angel had told her that He was the long-awaited Messiah. Did she know what would be required of Him to save the souls of all of us? To save her own soul? And what about His first words? I’m sure she treasured them, too. And His first toddly, wobbly steps. The first time He proudly built something with His carpenter father, Joseph. Did she remember those first steps as she heard the wondrous recounts of the Savior who walked on the water? Did she remember His first cries as He preached to a crowd of thousands? Did she recall bandaging His little boy-wounds as He healed the sick and the weak with just a touch of His hands? Did she remember the first time He called her Mama as she stood at the foot of the cross where He hung dying? When He took care of her, even in His time of death? I don’t know exactly what was going through her mind during these events in her Son’s birth, ministry, and death. But I know that Mary treasured the moments of His birth for a reason. She knew He was special. She knew He was the Messiah. She knew her boy was the One that all creation had been waiting for. The angel had told her He’d be the Most High King. But at the moment of His birth, as He slept in His mother’s arms, I think she just simply treasured Him and His love. She forgot about the pain of society’s censure and possible rejection of a young girl who became pregnant out of “nowhere”. She forgot about the stress of moving and having a baby in less-than-convenient circumstances. She just held Him and treasured Him in her arms and in her heart. Aren’t you glad that this Christmas, you can treasure Jesus and hold Him in your heart, too? This week’s song is so special to me. I heard these words whispered to my heart right after I got married, before I had my own sons. Each year the words become sweeter and sweeter as I watch my boys grow and think about the relationship Mary had with her own Son, Jesus. Mary. A servant of the Lord. A ponderer. A treasurer. Mother of our Savior. May we treasure Him the way she did. A baby cries, the stillness breaks. It’s a sound that all creation awaits. And Mary sighs, does Joseph weep, as they watch their baby fall asleep. And Mary treasures these things in her heart; Mary treasures these things in her heart. The star shines brightly over Bethlehem in a tiny stable, no one had any room for them. But that’s all right, because soon all will see this is Messiah; He has come to set them free. And the kings bow down to worship Him, this tiny Baby who will save them from their sin. Will she remember little fingers she loves so much as He grows to a Man who heals with a touch of His hand? Does she understand? Will she remember the cry of her baby boy as He calms the sea with just the sound of His voice and speaks the dead to life again? As her baby boy walks to Calvary, and He is bruised and battered and scarred. But for now He’s asleep in her arms, so she will treasure His love in her heart. And we can treasure His love in our hearts. Sharing words this week with holleygerth.com and faithalongtheway.com. This entry was posted in Devotionals, Music and Songwriting and tagged Christmas, Christmas and Jesus, Jesus, Jesus's birth as told by Luke, Mary and Jesus, Mary's Treasure, Paige Givens, The birth of Jesus, The life of Jesus. Bookmark the permalink. This is excellent Paige. So much faith tucked within those 13 words of Luke 2:19. What I needed to hear as I prepare my heart for the Christmas season. I’m glad it spoke to you as well! Thanks for reading! Such wonderful observations of what it must have been like for Mary and Joseph. I’ve asked myself a lot of questions the last few days about all the circumstances surrounding our Savior’s birth, and yours have spurred my curiosity even more. And what a beautiful song! You are very talented Paige. Keep writing…keep singing. You are a blessing. Beautiful words and so much that we don’t even think about that went on those 9 months and that miraculous night. Still one of my most favorite Christmas songs. I looked forward to each time you sang this at Mt. Zion. Thanks Crystal. I miss ya’ll! Thank you for helping prepare my heart for this Christmas season! Perfect words to begin the Advent season! What a sweet Christmas post! I love getting to hear the whole nativity story, but focusing on Mary put more of a perspective into the story which we’ve all heard many times- great post!